Those wishing to begin their freight broker career as a freight broker agent will find that the TALTOA Freight Broker Agent Training & Consulting packages go above and beyond what you might expect. At TALTOA your success is our success, and our focus is on your success from day one. Whether you choose to come to our location for your training, or choose one of the no travel options, it all starts with training. Each of our Freight Broker Agent Training & Consulting packages include the essential hands-on, in-depth training for you and a guest. As many of our clients have a family member or friend that will be assisting with their freight broker business, your guest is part of your team. They need this training to help your business be successful. Many have tried to duplicate the what and how of our services, which is flattering, but they fall short. 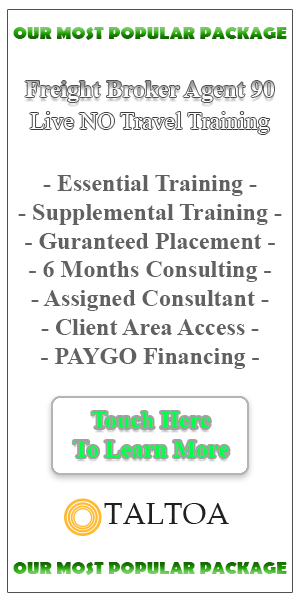 The package you choose is a consulting package that includes training, mentoring, and consulting. As a freight broker agent, you will be your own business. As a consultant, we’re consulting your business. We’re not training you then wishing you good luck. Although you will be a freight broker agent, you will be your own agency working under the license of a freight broker company. In short you will be your own independent office for that freight broker. This doesn’t mean you need to rent an office space, as most freight broker agents work out of their home. During the training portion of your Freight Broker Agent Training & Consulting package, you will be working toward becoming operational. This starts with learning how to find, contact, and respond to shippers that will use your services as a freight broker. From here we move into the day-to-day tasks of operating as a successful freight broker agent. This includes calculating rates, negotiations, finding trucks, legal, contracts, and much more. We’re not just showing you how to do it, you will be doing it. You will be working with the actual tools, programs, and software that will be used daily when working as a freight broker agent. When the training portion of you package is complete, you will enter the TALTOA Mentorship Program (TMP). We initiated the TMP in 2018 and it’s been a great success. The TMP allows you to begin working as a freight broker agent right after training under the guidance of your TALTOA consultant. Our clients have found that the TMP provides them with greater support, assistance, and the opportunity to find success quicker. The TMP allows new agents to gain more experience, faster, as they will immediately begin using a Transportation Management System (TMS). Think of this as freight broker software for your office. In addition, the TMP allows you to keep your overhead at a minimum when first starting your freight broker operation. As any business has overhead, you want that overhead to be as little as possible. The TMP allows new agents to keep their overhead as low as $60 a month. In addition, as you grow your business, the TMP is designed to pay these overhead expenses in addition to the monies you’ve earned. There is no time limit for how long you can participate in the TMP. The TMP is designed for your success, you can exit the TMP whenever you wish, and retain your customers. This means that should you wish to contract to another broker or even start your own freight broker company, the work you did while in the TMP is yours. When the time comes for you to move on from the TMP, as an agent for a new freight broker, your consulting continues for the length of time specified for your package (3, 6, or 12 months). For example, you chose the Freight Broker Agent 90 Training & Consulting Package with 6 months of consulting. You participated in the TMP for 3 months and decided to contract to a new broker. Your 6-month consulting period would continue for 6 months after exiting the TMP. Should you decide to start your own freight brokerage, you would receive a credit from the package chosen, applied to your annual freight broker consulting period. Depending on the Freight Broker Agent package chosen, your credit could be as much as $600. If you’d like to learn more about any of our Freight Broker Agent Training & Consulting packages or the TMP, feel free to call.